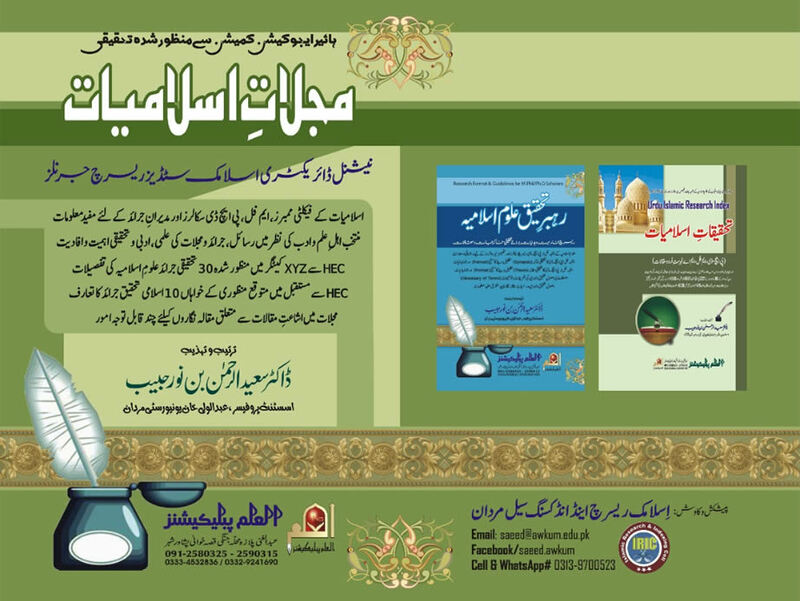 Dr. Saeed-ur-Rahman Assistant Professor, Department of Islamic Studies, AWKUM has published a book named "Majallat-e-Islamiyat (National Directory of Islamic Studies Research Journals)". The book discusses the importance & significance of Research Journals & other Scholarly & Literary Periodicals in the light of quotations & expressions of 100+ subject experts of the Indo-Pak. The detailed updated Directory presents Category-wise names, ISSN, Year of Issuance, Indexing Agencies, Name of Editors, Department/University or other Concerned Organization, Website/ Official Link (s), Contact Details, Title Images and other useful information about 30 HEC Recognized Research Journals (XYZ Categories) and 10 HEC Patterned Research Journals which will facilitate the Faculty members and Research Scholars of Islamic Studies to access them easily for paper publishing, reading, referencing or other scholarly purposes. At the end of the book detailed guidelines for researchers regarding publishing of Articles and submission of papers to research journals are also given. The book comprises of 200 pages which is published by Al-Ilm Publications Peshawar.